Will an iconic hospital emerge from life support? 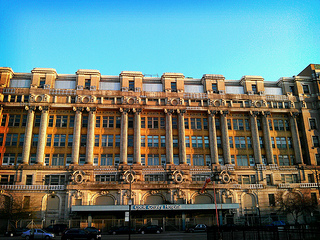 The old Cook County hospital's facade earned the beaux-arts structure landmark status. Dorota Gosztyła asked Curious City to look into the future of the old Cook County hospital building. 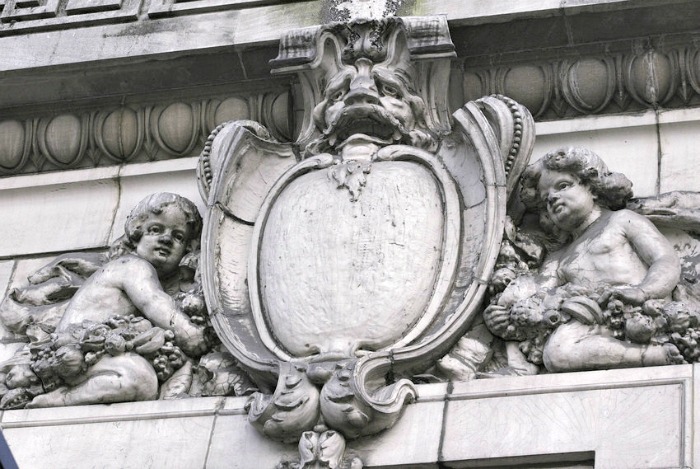 The now-vacant beaux-arts landmark will see its 100th anniversary in 2014. Like many residents of Tri-Taylor, Dorota Gosztyła hopes her Chicago neighborhood will finally figure out what to do with two city blocks of brick and terra cotta rising up from Harrison Street. 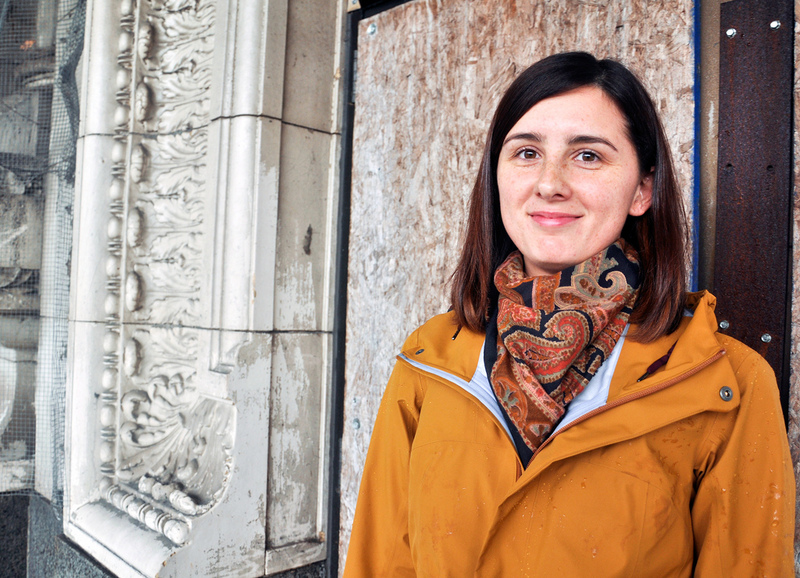 “I find the building to be beautiful, and I think it’s a shame that it’s just standing here vacant,” says Gosztyła, 35. She often glimpses the old Cook County Hospital building while driving on the Eisenhower Expressway (I-290). The hospital’s fluted columns soar three stories, lining a facade festooned with classical symbols: cupids, lions, warriors’ shields. What will become of the old (and now vacant) Cook County Hospital? The building, 1835 W. Harrison St., is hard to miss. When it opened in 1914, it had space for 650 patients. Subsequent expansions made it the world’s largest medical facility from the 1920s until the 1950s. Among the superlatives it racked up during that time: It was home to the world’s first blood bank; Chicago’s first HIV/AIDS clinic in 1983; the site of the country&apos;s first dedicated trauma center; and in 1973 Dr. Boone Chunprapah became the first doctor to successfully reconnect four severed fingers to a patient’s hand. While its architectural significance has never been in doubt, the aging structure isn’t a sure bet for rehabilitation. New construction now surrounds the site, and it wouldn’t be the first time Chicago has demolished a historic building in the name of progress. Gosztyła’s question got us talking with people who know the building’s history and its potential for redevelopment. The bottom line is that preservationists and county officials seem to agree on this: The building can and should be saved. What remains unclear, however, is just how to do that. Before it made medical history, Cook County Hospital was an architectural achievement. Architect Paul Gerhardt, who designed the building in association with Richard E. Schmidt and Hugh Garden, was known nationally for his hospital designs. Gerhardt also designed Christ’s Hospital in Topeka, Kan., as well as Chicago’s Michael Reese Hospital. Cook County Hospital is one of the city’s best and largest-scale examples of Beaux Arts architecture. Landmarks Illinois’ reuse plan for the building makes note of its mansard roof, made with green glazed terra cotta, and other ornamental details. But it also calls attention to the steel frame; the widely spaced columns preserve an open floorplan conducive to reuse. The preservation group’s analysis called for turning the building into 320 residential units for medical staff, a 95,000 square foot health and wellness center, ground-floor commercial space, and 150 parking spaces. Their recommendation changed slightly when the county demolished the building’s three southern wings in 2008 (they were not original to the building, but still considered a loss by preservationists). Like another study commissioned by the county, they recommended repurposing the building primarily as office space. While the studies concluded modern medical equipment would be too heavy for the building’s aging floors, they didn’t rule out reuse as a hotel, dormitory, rental housing, senior housing, or educational space. “Our first and primary goal is to preserve the building,” says John Cooke, the County’s director of capital planning and policy. But that wasn’t always the case. Under Cook County Board President John Stroger’s administration, the building’s future seemed in doubt. The building closed in 2002, and Stroger called for its demolition while a new hospital bearing his name went up next door. Preservationists and several board members fought the demolition idea, and in 2006 the building landed on the National Register of Historic Places. Four years later the board voted to preserve the old Cook County Hospital building. Until the building is actually occupied again, its future remains uncertain. Cook County officials are waiting for U.S. Equities Realty to recommend future uses and repairs for a slew of county-owned buildings, including the old hospital. Cooke says once the company’s report is in, the county will issue a request for proposals to solicit interest from architects and developers — likely in the spring of 2014. The two-block long building could be subdivided into three 185-foot sections for phased development, making it less risky from a financial standpoint. And while the county isn’t going to sell the site, Cooke says, it’s investigating lease arrangements to encourage private development. That could mean a ground lease, whereby the county sets out what uses and spaces it wants; and a developer pays for improvements to the building, provides said space, and pays an annual fee to the county. A Jones Lang LaSalle reuse study puts the cost of reusing the building between $103.9 million and $120 million depending on its use. That could be reduced by as much as $50 million through the use of Tax Increment Financing (TIF) funds from the Central West district, the study says. Historical preservation tax credits could also offset 20 percent of the total project cost. By contrast, demolition could cost as much as $13.6 million, in addition to the cost of new construction. Is that enough to entice developers? Cooke said the County will find out in 2014. But preservationists are eager to see the mothballed building get another chance at reuse. How daunting can it be? Now the question is how (not whether) to resuscitate the building. Though its presence can be imposing to passersby (including our question-asker, Dorota Gosztyła), the old hospital building isn’t too intimidating to architects who specialize in adaptive reuse. Joe Antunovich, president of Antunovich Associates, has tackled many such projects. His firm’s own office, 224 W. Huron St., occupies the top two floors of a brick building more than 90 years old. In Pittsburgh, the company transformed the dilapidated Armstrong Cork Factory along the Allegheny River into 385 apartments. As for Cook County’s old hospital building, he says office space is a strong possibility. Antunovich and others hope any development will celebrate the hospital’s history. Gosztyła, our Curious City questioner, suggests a museum dedicated to that purpose. McDonald, of Landmarks Illinois, suggested that a mobile app could spout historical facts to interested visitors. Chris Bentley is a reporter for WBEZ’s Curious City. Follow him at @cementley.